Stocks rebounded at the markets close on rumors that the G20 group of major economies were planning a $600 billion lending facility at the International Monetary Fund to stem the European debt crisis. NEW YORK (TheStreet) -- Stocks rebounded at the markets close on rumors that the G20 group of major economies were planning a $600 billion lending facility with the International Monetary Fund to stem the European debt crisis. The IMF has denied the Nikkei report. The Dow Jones Industrial Average rose 46.2 points, or 0.3%, to close at 12,196 after losing 89 points at the session's low due to the potential for further disappointment regarding Europe's debt plans. 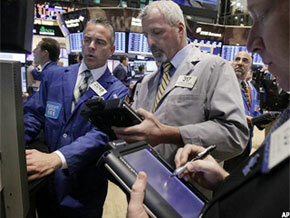 The S&P 500 rose 2.5 points, or 0.2%, at 1261 and the Nasdaq ended 0.3 points lower at 2649. Earlier in the trading session, negative comments from a German official spooked investors hoping for significant progress on Europe's debt problems at a summit later in the week. Reports cited a German official saying that leaders may take until Christmas to agree on a new treaty that encourages closer political and economic ties between 17 countries using the euro. Meanwhile, on the upside, some economists expect the European Central Bank to cut rates again on Thursday. Furthermore, some market participants see the dire situation in Europe as strong incentive for officials to deliver substantial results at their meeting in Brussels on Thursday and Friday. Leaders are expected to further their discussions on the possibility of having a second bailout fund instead of working to boost the existing rescue fund. Putting further pressure on European Union leaders to act quickly to resolve the debt crisis was rating agency Standard & Poor's negative outlook on the region. The agency said Wednesday afternoon that it has placed the ratings of some the largest banks in the eurozone on its negative outlook list and that similar actions will soon take place for other banks in the single-currency bloc. This follows S&Ps warnings earlier this week about a possible debt downgrade of 15 eurozone nations as well as the region's bailout facility itself. "The weak action ... is probably healthy as patient holders take gains and underinvested bulls finally have a chance to buy a dip," said James "Rev Shark" DePorre, founder and CEO of Shark Asset Management. Germany's DAX finished 0.5% lower and London's FTSE closed down about 0.3%. Overnight, Japan's Nikkei Average settled 1.7% higher, and Hong Kong's Hang Seng Index closed up 1.58%. "Investors are betting their hopes that politicians will come up with something but that might not come out to be true based on history," said Weyman Gong, chief investment strategist with investment firm Signature. "We may see investors try to take some chips off the table to prepare for a potential disappointment." Nicholas Colas, chief market strategist with ConvergEx also noted that investors are taking a step back to focus on how their stock gains will affect tax payments for the year. "Rewinding back to this month, the iron grip of the tax man means that investors of all stripes are cleaning out their portfolios of losing positions in December, taking losses to offset against winners," he explained. "Investors holding a losing stock who want to take the tax loss for that position will sell it sometime this month." With no major US economic reports slated for the day, investors will continue to feel at the whim of headlines out of Europe. "The absence of any known data or Fed events on Wednesday leaves us to grapple with the few pieces of new 'information' from Europe - namely a proposal by the EC president that would effectively fast-track any deal reached on Friday and the subsequent dismissal of this idea by German officials," said David Ader, head of government bond strategy, and Ian Lyngen, senior government bond strategist, with CRT Capital. In corporate news, Talbots ( TLB received a buyout offer of $3 a share from Sycamore Partners. Shares soared 69.9% to $2.65 Wednesday. Delta ( DAL will pay $100 million for a minority stake in Brazilian airline Gol Linhas Aereas Inteligentes ( GOL. Gol Linhas gained 5% to $8.78. Citigroup ( C plans to cut 4,500 jobs in coming quarters, and will record a fourth-quarter charge of $400 million related to the job reductions. Reports had suggested the bank would lay off at least 3,000 workers as part of broader efforts to cut expenses by 3% to 5%. Shares were up 0.3% at $29.83. J.C. Penney ( JCP will buy a 16.6% stake in Martha Stewart Living Omnimedia ( MSO for $38.5 million or $3.50 a share. As part of the deal, Martha Stewart Living will have retail spaces inside J.C. Penney stores beginning February 2013 and the two companies will launch a joint e-commerce site in 2013. Martha Stewart Living shares surged 33.3% to $4.16, while J.C. Penney was up 0.6% to $33.51. January oil futures fell 79 cents to finish at $100.49 a barrel, and February gold futures rose $13 to settle at $1,744.80 an ounce amid expectations of more stimulus action by the ECB. The benchmark 10-year Treasury was up 19/32, diluting the yielding to 2.024%, and the U.S. dollar was flat against a basket of currencies. The euro was trading sideways against the dollar.